Everything you need to care for your gear is here in the Complete Care Kit which contains a 16 oz. WASH, 16 oz. REFRESHER, 16 oz. PROTECTOR and 4 oz. SPOT CLEANER. Caring for your racing suit has never been easier. No more expensive dry cleaning. Molecule now makes machine washing the best way to care for Nomex® and other technical fabrics. Ordinary laundry detergents contain additives that can attract moisture, oils and flammable stains. Molecule has been designed for the unique soils of the racing environment. It removes even the toughest stains. Racing suits made from Nomex® technical fabric have extraordinary properties to protect drivers from flames and heat. Care instructions published by Nomex® manufacturer state that this unique fabric requires special care to be fully effective. Get the newest thing in motor sports safety: The Molecule™ Technical Fabric Care System. Caring for your racing suit has never been easier. No more expensive dry cleaning. Molecule™ now makes machine washing the best way to care for Nomex(R) and other technical fabrics. Ordinary laundry detergents contain additives that can attract moisture, oils and flammable stains. Molecule™ has been designed for the unique soils of the racing environment. It removes even the toughest stains. Racing suits made from Nomex® technical fabric have extraordinary properties to protect drivers from flames and heat. Care instructions published by Nomex® manufacturer DuPont? state that this unique fabric requires special care to be fully effective. DuPont's laundering guide cautions Nomex® users that the fabric must be kept clean. "Flame resistance can be compromised by the presence of flammable contaminants on the garment, " the guide explains. However, DuPont? advises against using ordinary soaps for removing these contaminants. "Soap scums may be flammable and could adversely affect the thermal ensure safety and comfort. 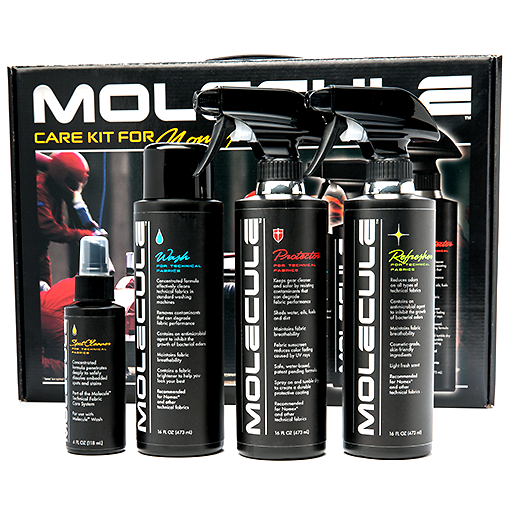 Molecule's Care Kit for Nomex® (Molecule works and has been tested with Nomex, CarbonX, Proban, Fire retardant cotton. . all technical fabrics): MOLECULE? PROTECTOR - Bonds to Nomex® fabric to help repel flammable stains. Maintains breathability. Helps keep colors vibrant by shielding UV rays. Recommended for Nomex® and other technical fabricsMOLECULE? WASH - Effectively cleans Nomex® fabric in standard washing machines. Removes contaminants that can degrade fabric performance. Antimicrobial agent inhibits the growth of bacterial odors. Recommended for Nomex® and other technical fabricsMOLECULE? REFRESHER For Technical Fabrics - Keeps suits fresh over long racing weekends and between washings. Contains an anti-microbial agent to inhibit the growth of bacterial odors. Recommended for Nomex® and other technical fabricsMOLECULE? SPOT CLEANER - Penetrates deeply into Nomex® fabric to dissolve and suspend tough spots and stains that can create combustible hot spots.